On the Goudsesingel, just a stone’s throw from the Meent in the city centre, you will find Mr. Salad. Don’t be misled by the name, there is so much more than salad on offer here. Open since April 2017, Mr. Salad was one of the front runners in aiming and succeeding in providing healthy food and snacks on the go. Alternatively, stay, take a load off and enjoy all the tasty nutrients. The interior is uplifting, and all the food is freshly made. All allergies can be catered for, just tell the staff and you’ll enjoy some of the tastiest food around. This find is one which started with apprehension; let’s try the healthy high tea. If a high tea is healthy, how can it possibly be as fulfilling? Little did I know that Mr. Salad has found a healthy alternative for every craving without compromising on taste. Feel-good guilt-free food! One of the things I love about Mr. 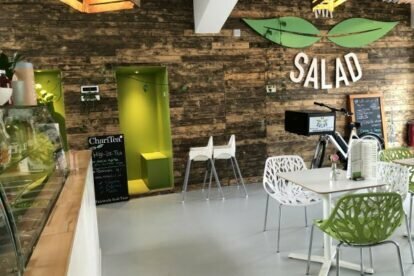 Salad is that although it caters for all allergies and lifestyles, be it vegan, vegetarian, pescatarian or carnivore, everyone is well taken care of and can enjoy a finger-licking meal. Personal favourites include the spring rolls with chicken, mango and full of veggies, the power buddha bowl, the fruit toast with almond butter, fresh fruits and chocolate and okay fine, all the sweets. The best part is you can tailor-make any salad or wrap so whatever you are craving, Mr Salad has your back.